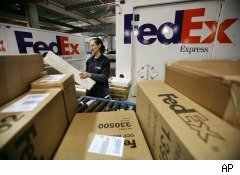 When FedEx Corp. (FDX) posts third-quarter results on Thursday morning, both economists and shareholders will be paying keen attention. The company, long considered a barometer for the general economy, previously projected earnings of 50 cents to 70 cents per share, but Wall Street thinks the company could handily top expectations. Financial analysts are currently looking for a mean of 72 cents per share, according to a First Call survey. The estimates suggest results could increase more than twofold from last year, when the company posted earnings of 31 cents per share. "Things appear to be going better than expected," says Morgan Keegan analyst Arthur Hatfield. "Coupled with a strong pricing environment, we're looking for better-than-expected results and maybe an improved outlook." And if FedEx serves as a U.S. economic indicator, the company's results may signal the beginning of an economic turnaround. "This definitely could be a sign that we're at the very early stages of a recovery," says Hatfield. "It will be slow, and it will probably come with some pain and headaches, but I think we're on the right track." But not everybody thinks a recovery is in the works. Robin Griffiths, a technical strategist at U.K.-based Cazenove Capital, recently told CNBC that FedEx's results could indicate a double-dip recession. "[FedEx] management are indeed pointing out that although they have done jolly well, there is a risk of a double dip . . . And I have to say with all my work on cycles, if I've learned anything in my life, it says that there isn't just a risk of a double dip, the probabilities are such that I think it's baked into the pie and is inevitably going to happen," Griffiths told the financial news network.